Japanese trio Boris and noise musician Merzbow never cease to amaze with their longstanding collaborative stronghold. Both artists have been creating music since the early 90s, and have always estranged themselves from categorization, even far beyond alternative music. Their combined sound, which came into fruition in 1997, is complimentary to the fullest extent. Whenever Boris chose to express themselves in shoegaze, indie rock or metal variants, Merzbow would create a twisted realm of glacial distortion—free-form, often harsh, coarse and blackened, yet worthy of inducing an equally lasting head rush. Their latest album, Gensho, essentially allows the listener to construct their own sonic universe. Its lack of percussion makes Merzbow’s contribution a pseudo-percussive milieu of sorts, to stimulating, yet ultimately variable results. [/column] [/columns] Boris’s disc consists mostly of tracks from previous releases, albeit in an updated form to fit the album’s primarily drone-based direction. In doing so, the warmth emanated from the guitars is smoother, the vocals brighter, and the low end occupies seemingly limitless space. “Farewell,” originally off 2006’s Pink, still evokes the same pleasantries as its original incarnation. The slightly dissonant lead melodies maintain prominence, while the vocal harmonies—mesmerizing and instrumental in their own right—are kept afloat. Even the higher range vocals never lose their quality of gentleness; they’re generally soothing and blend seamlessly into the guitar layers. The track to follow, “Huge,” off 1998’s Amplifier Worship, contains two distinctly contrasting elements that help define it. Its original supporting texture, which resembled a distant, brewing thunder, is now replaced by faint shrieks of progressive feedback. Anguish-ridden scream vocals are now grim, blackened and guttural—an inadvertent but well-executed shift of dynamics. Its length is extended by another minute or so, wrapping up with bursts of chugging and bended riffs. Some songs unexpectedly deviate from the album’s intended flow. In particular, “Resonance” is essentially a straightforward demonstration of acoustics, featuring simple and effective cymbal crashes that traverse between background and foreground. On the other hand, “Rainbow,” off its eponymous 2006 album, is left in a conventional mid-tempo form, featuring a minimal tambourine tap as the album’s possible sole showcase of percussion. Michio Kurihara reprises her role as guest vocalist, enveloped by a pre-delay that matches the haunting rhythm guitars. I actually liked how the fuzzy lead guitar sat almost completely out of the mix, to the point of coming off like it received little EQ treatment. It is surprises like those that show the extent of Boris’s experimental side, as well as evidence of a band’s solidified appeal amidst industry sound standards. A highlight track that especially piqued my interest is their droned up cover of “Sometimes” by My Bloody Valentine; it is equal parts a unique rendition and representative of this album’s sound, and is sensibly placed in relation to the other tracks. Perhaps my favorite track on Boris’s side by a long shot is the Gensho version of “Heavy Rain,” as its feel somehow undergoes considerable transformation by its slowed tempo and its drum rhythms being non-existent. 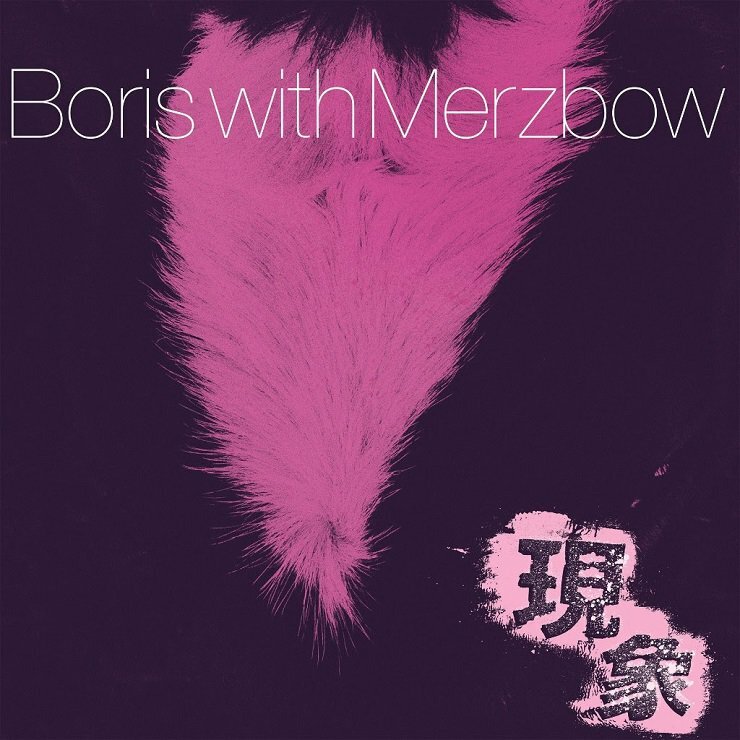 For Merzbow’s disc, the tracks are few and considerably longer, serving as backdrops for each group of Boris tracks. Normally I am not a regular listener of noise music, but Merzbow nonetheless kept my interest. The ideas he creates are exceptional, though mainly through the album’s optional ‘simultaneous’ method. The wailing tones that comprise “Planet of the Cows” do much as to enhance the surroundings of “Farewell” and “Huge.” There’s a feeling it emits of a world coming apart at its seams—of all life having been obliterated, yet ironically ending suffering in the process. With shape-shifting synths and varied pitch registers, its consistency provides an efficient means of fleshing out Boris’s guitars. The second Merzbow track, “Goloka, Pt. 1,” consists of cold stationary static that mutates into atonal saw-like spurts throughout each speaker. In the time since Gensho’s release, points were brought up as to whether the combined sides work in all cases. While I can definitely notice the effect on Boris’s “Resonance,” consisting simply of a cymbal in cave-like reverb, the streamlined “Rainbow” and “Sometimes” seem all the more drowned out. Fortunately, the penultimate “Goloka, Pt. 2” is a slightly better pairing for the next two Boris tracks. Its textures are complementary to “Heavy Rain”’s down tuned guitars, showing sufficient progression in its harsher parts, even showing gradual gentler moments during “Akuma No Uta.” Perhaps the most noteworthy, and by far the hardest track to listen to is the strangely titled closer, “Prelude to a Broken Arm,” I’d consider it strange from a conceptual standpoint, provided that its textures actually depict not just a prelude, but also an apparent ‘aftermath’ phase. The initial six minutes of the song represent a period of calm and collectiveness—perhaps an everyday leisurely drive—with minimalist, repetitive white noise. At 7:49 onward, the sound pattern, noticeably louder, gets abruptly cut-off by a blistering distortion (think of an accident involving the car engulfing in flames and spinning out of control). By the 15:30 mark, there’s a tone that resembles a medical monitor, showing that the victim involved has indeed broken more than just their arm. Although in some way, there is a degree of contentment in knowing that Merzbow’s final bit part to end the album is at a reasonable listening level. Overall, Gensho is an unpredictable ride through comfortable nostalgia and hard-to-swallow invention. The Boris disc is solid on its own, and is typical to entice fans with its updated arrangements of classic songs. On the other hand, Merzbow’s tracks, though innovative, are discomforting to average ears, and possibly even to regular noise music listeners. But where the tracks exhibit difficulty individually, their efforts are greater felt when both discs are played in combination. To get the most out of the experience, I’d strongly recommend playing Boris’s disc as the dominant, while Merzbow’s is adjusted in the mix to serve as its complimentary atmosphere.